lol, your dog drinking your tea sketch is pretty cool regardless. funny how certain things seem to attract them and others not. my little vash will go "check" out stuff but then run away. he especially doesn't like the smell of coffee...good thing for me! hehe! When I first saw your blog title, I thought you were vacuuming up your painted petals :). I'd think your tea would be too hot for Mushu, but if you're anything like me, you get distracted with what you're doing and let it go cold. lol Thanks for the link to Artists in Blogland. I've joined up too :). Enjoy your new chairs! This was so funny! Love it! This is just beautiful, love the rich colours. Just when you think you're comfortable, along comes 'distractions'! You did come up with something spectacular, beautiful piece! Your puppy likes tea, that makes me smile! A beautiful painting regardless though! Beautiful piece. My cat likes to try anything I'm drinking. He doesn't always come back for seconds but he does need to check it out. My cats keep stealing sips from my water when I'm not keeping my wits about me so I know what you're up against. And to be foolish enough to leave your cereal bowl unattended and expect there to be milk left in it, is frankly your own fault!! Beautiful art - regardless of doggy distraction! Even on your tough days your sketches blow my mind. The shapes of the petals and leaves amaze me. As for the tea drinking pup - all the best with that - our dog has US pretty well trained so that he usually gets what he wants. even though you were distracted by your doggy, your painting turned out great! Welcome to SS! Wow! First off...love LOVE your header! SO much. LOVE English Tea, as well as making it. Brilliant. I can relate to the tea stealer, my parrot drinks my coffee if I don't guard it. Does kind of kill the moment for a cuppa doesn't it. Still you managed a beautiful picture. I think you did do something beautiful, I see no white hairs in it either! I wonder if your dog is keeping a similar eye on you and worrying if you're getting into his tea ... lol. My kitty used to do the same with my cheese and water. Beautiful art piece. I look forward to seeing more. Your work is beautiful, Tracey! 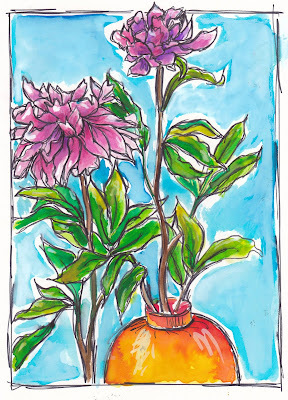 Such great technique, and such a wonderful sense of color. So warm and happy and vibrant. I have to laugh about your dog and tea... because mine used the be the same way with my lemonade! We'd be sitting side by side, watching TV, and I'd hear sllluuuuurrp! And he'd be sticking his tongue into the glass. Adorable little devils, aren't they? We can't leave glasses of water on the table. They attract curious cats who like to take a sip because it tastes oh so much better after I human has used it. They also like to run tests on gravity, just to make sure it's still in proper working order. great colors!!!!!! i think it turned out great! The picture turned out great, despite the distractions. 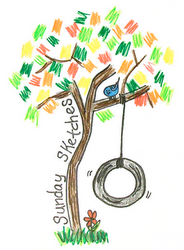 Lovely sketch,I am happy to welcome you to the Sunday sketches. I don't post every week but do like to often. Your work is very nice, Thanks for popping over to my blog. sweet sketch. I like your use of colors, very soothing with a touch of brightness. Lovely flowers. I have a cat that likes to drink from my coffee cup if I leave it sitting somewhere, at first I thought he like the cream in the coffee but then a visitor who took their's black left it sitting and he was caught drinking that too. Ha so your story about your dog is so hilarious. At my ripe age, I like chairs that aren't too low so I can easily get out of them. Thanks as always for the smile- I do so LOVE reading your posts, and if there were smudges in this painting, I can't see them! Now, I'm off to catch up on what I missed last week- looking forward to more smiles! Hilarious! He needs his own cup of tea. Simple solution. :-) Ah, the torment we artists have to endure. I had a golden retriever who had a love for coffee, with cream, thank you very much. so happy to be back and visiting, your paintings are glorious. Love the tea pot in the past post. Dogs.......you got to love them! 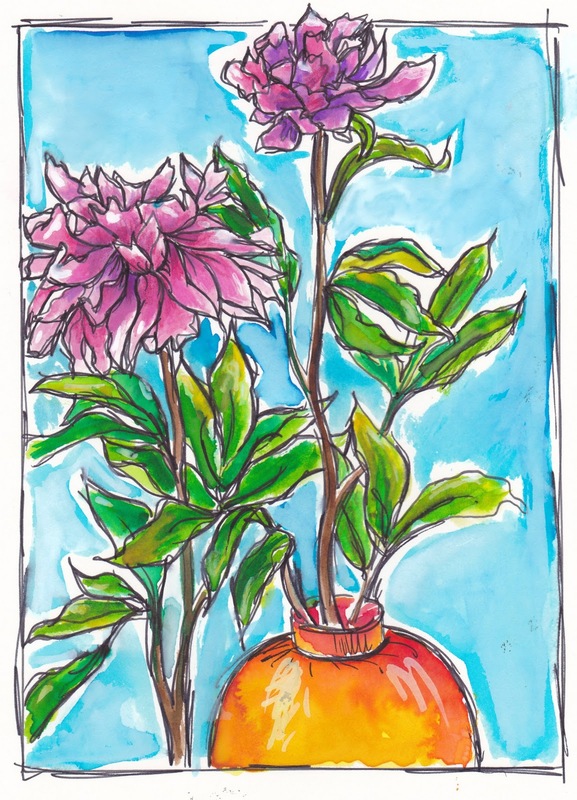 The colors of your sketch are wonderful and flowers are a pleasant sight during these dark days, thanks! lovely flowers by the way!